Did you know that May 13th is National Hummus Day? Break out the tortilla chips! Personally, I am fully behind taking a full day to celebrate a food that has given me so much. Hummus and I...we go way back. Along with our other dear friend, Pita, Hummus has gotten me through many a late night, keeping me fed during my broke college years. I can't imagine the dumb things I could have done if hummus wasn't always there to talk me out of hanger-induced foolishness. Of everything hummus has done for me, I think I'm most appreciative of hummus for being by my side during that long stretch of time between lunch and dinner, standing in as my "unofficial meal." When I need a little pick-me-up to make it through to dinner, I can always turn to hummus. 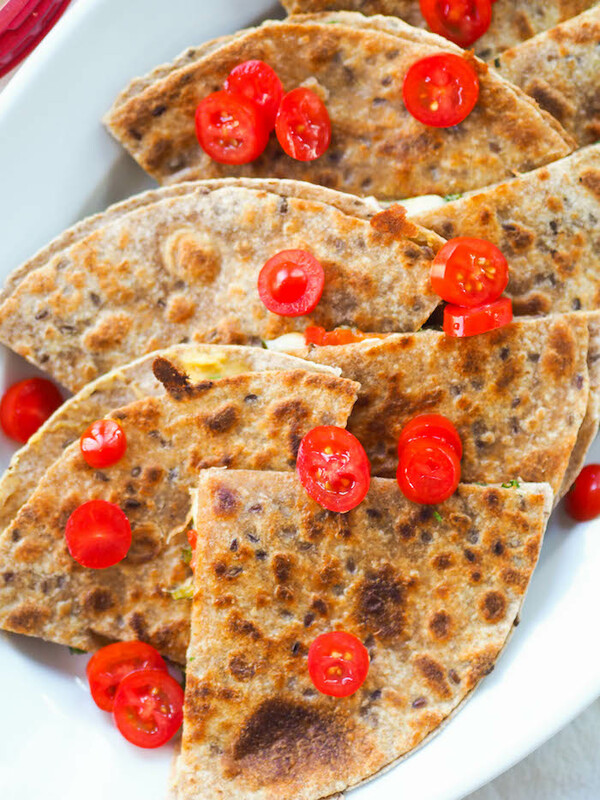 This recipe for Mediterranean quesadillas is perfect for mid-afternoon muching. It's stuffed with two kinds of cheese, Sabra's roasted garlic hummus, kalamata olives, roasted red peppers, and a little arugula. It comes together in just minutes with ingredients you probably have on hand. If you're out of cheese (cheese goes fast in this household) or don't eat it, just leave it out and hummus will give you all the creaminess you need. As you know, I'm a big believer in honoring your hunger. I hear a lot of fear from clients who are afraid to eat a snack in the late afternoon. They think it will spoil dinner or that it's not allowed, since they're going to eat dinner soon. I don't know about you, but sometimes I come home from work famished. I'd rather eat a satisfying snack, enjoy a leisurely walk with the dogs to decompress from the day, and then get to work cooking dinner, without fear of falling into a hypoglycemic coma while chopping carrots. And frankly, an apple just won't do. That's where this unofficial meal comes in. 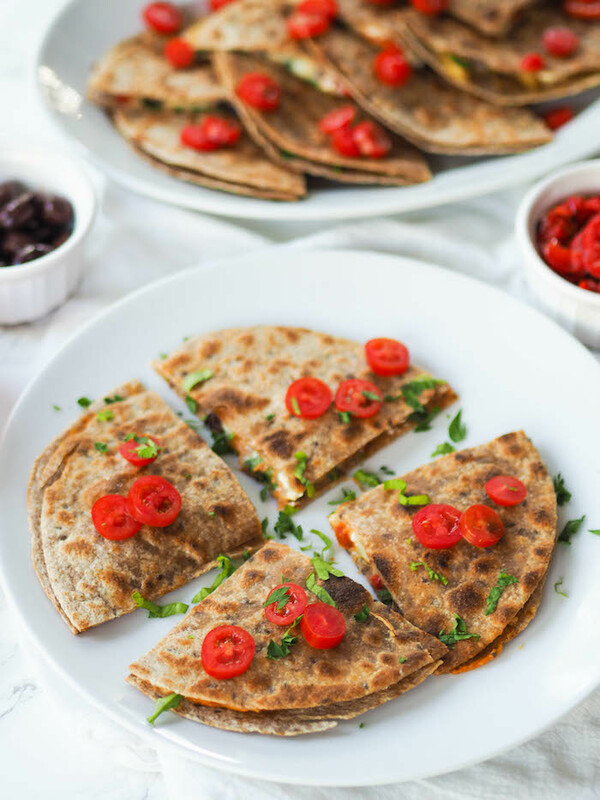 If you need just a little satisfying bite, enjoy one slice of quesadilla, and save the rest for snacking another day. If you need more, eat more. You could even turn this into a quick dinner, pairing it with a salad or your favorite side dish. 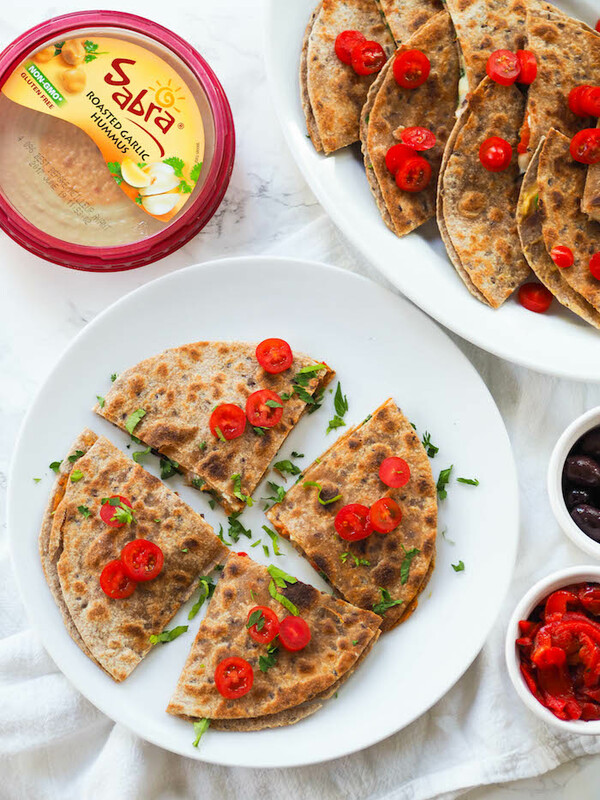 I always find myself turning to Sabra hummus when I need a satisfying and tasty bite. With protein, fiber and filling fat, it's a snack food that sticks. Sabra makes so many delicious flavors, it's impossible to get bored! Personally, I'm a big fan of supremely spicy, with an honorable mention to lemon twist and roasted red pepper. I also love hummus because it's so versatile for those who don't eat meat, or are cutting back. For snacks, I always recommend pairing a carbohydrate containing food with something else that has fat and/or protein. For savory, plant-based snacks, try brown rice cakes topped with Sabra's lemon twist hummus, tortilla chips with jalapeno Sabra hummus, or nutty, seedy crackers with rosemary sea salt Sabra hummus. Heat olive oil in a skillet on medium-high heat. Add one tortilla. Sprinkle the top with both cheeses, olives, and roasted red peppers. Cook until cheese is melted. While the cheesy tortilla is cooking, spread the other tortilla with a layer of hummus. When the cheese is melted, top with handful of arugula followed by the other hummus-smothered tortilla. Using a spatula, carefully flip and cook 1-2 minutes on the other side until slightly crispy. Remove from skillet, cut into wedges and serve immediately.